BETHLEHEM (Ma’an) — Thousands of Palestinians on Saturday attended the funeral of Laith al-Khaldi, 17, who was killed by Israeli forces during clashes near the Atara military checkpoint in northern Ramallah the previous night. Al-Khalidi was at least the 20th Palestinian to be killed by Israeli forces since the start of 2015, not including those killed in attacks by Israeli settlers or prisoners who died while in Israeli jails. 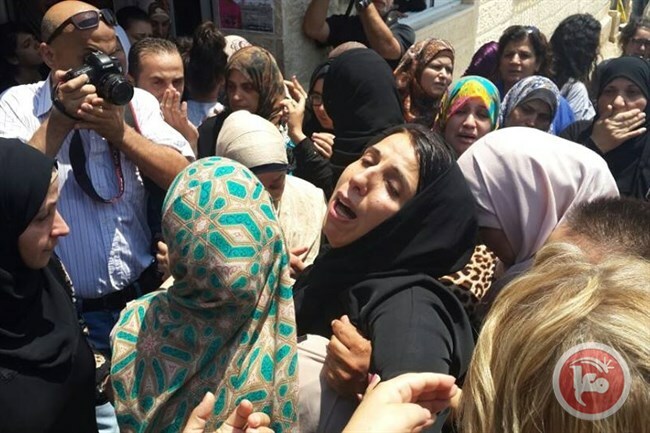 The funeral procession began at the Ramallah hospital where al-Khaldi’s body was being held and proceeded towards the al-Jalazone refugee camp where the teen was born. Mourners condemned Israeli crimes against Palestinians. Al-Khaldi was shot in the chest by Israeli forces after allegedly throwing a Molotov cocktail at the checkpoint’s army post. The 17-year-old later died from his injuries after undergoing two surgeries. Several other Palestinians were injured with rubber-coated steel bullets during clashes near the checkpoint at the time. Clashes broke out across occupied East Jerusalem and the West Bank on Friday night in response to the death of an 18-month-old Palestinian who was burned alive in an arson attack carried out by suspected Israeli settlers earlier that day. Earlier Friday evening Israeli forces also shot dead 17-year-old Mohammad Hamid al-Masri in the Gaza Strip near the buffer zone, along with another Palestinian who was shot and moderately injured. Four Palestinians were killed by live Israeli fire in July alone, in addition to the 18-month-old baby left dead by the Israeli settlers’ arson attack. The mother and father of the infant are still in critical condition in Israeli hospitals. Shortly after the attack senior PA official Riyad al-Maliki rejected Israeli condemnations of the incident as hollow. “The arson attack was a clear reflection of the “incitement and hatred” against Palestinians that the Israeli government portrays daily in its policies, decisions and laws, al-Maliki added. Palestinian leadership is currently pursuing charges against Israeli for war crimes in the International Criminal Court as rights groups argue Israel’s investigative mechanisms are not capable of carrying out credible investigations into alleged violations of international law.